Are you ready to Rokh? You will be by the end of this week's edition of the Kills of the Week, featuring kills from the week of January 19th @ 00:00 EVEtime through January 25th @ 23:59 EVEtime. Yes, I used the words "kills" and "week" a lot just now. But trust me on the Rokh thing. Who doesn't love to start out the week with a nice, fresh fish? Demetrioz of CAREBEAR INTERNATIONAL corp wasn't fooling anyone with his active hardeners. The trouble with active hardeners is that you need to be at your keyboard to activate them. Agents Kypermethrin, loyalanon, Buck Futz, Sarthana, iZaEaRl, Rikii, Puskarich, Schlampa, Ima Wreckyou, xxBLACK SKULLxx 929, Sophia Soprano, and Lorowacci decided to pay Demetrioz a little visit. Carebears may be international, but New Order Agents are galactic. You know how the rebels say if you fit a damage control and reinforced bulkheads your Orca is immune to the Code? There's a flaw in that theory. 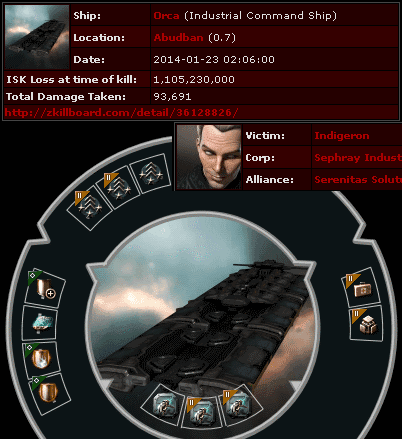 Indigeron ran afoul of Apocriphia of The Marmite Collective (presumably during an active wardec), who was joined by Agent Sarthana for this billion isk Orca kill. 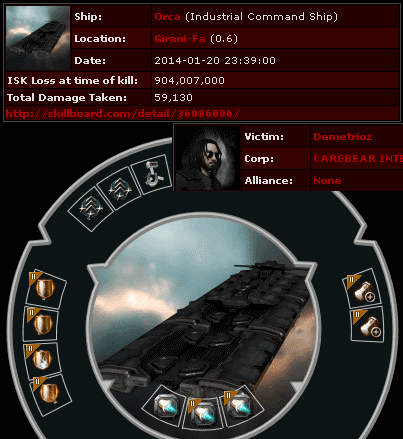 In addition, Apocriphia was kind enough to share the carebear's 1.5 billion isk pod with Agent Ima Wreckyou. Tank or no tank, the Code always finds a way. I must say, a lot of Orcas got slaughtered this week. There were so many to choose from, and this will have to be the last one featured in today's post. 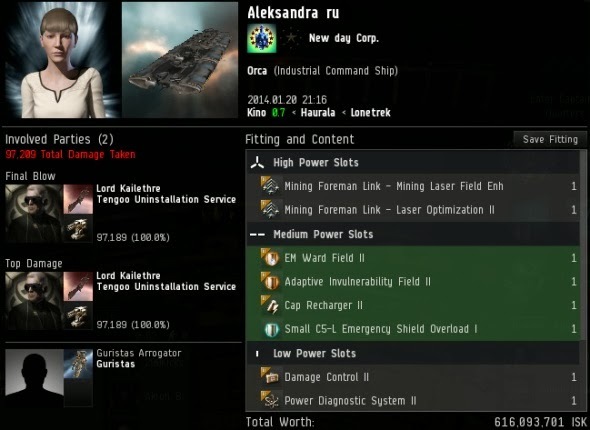 Aleksandra ru managed to get his Orca solo'ed by Agent Lord Kailethre's Stabber. Obviously this wasn't a suicide gank. A wardec? No. Kill right? No. Can-flipping? Of course not. This Orca kill was brought to you by a Mobile Tractor Unit. How? We'll discuss that more another time. I'll be honest with you, readers--I'm not a fan of some of the new ship artwork. Ships like the Astero and Stratios and Venture have art that just doesn't fit in with the rest of EVE's ship designs. For that reason alone, I'm inclined to say kill them on sight. 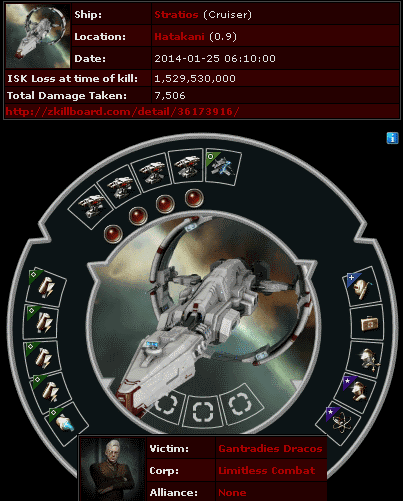 Gantradies Dracos of Limitless Combat (snicker) corp committed the crime of blinging out his Stratios cruiser with 1.5 billion isk worth of decadent modules. He made his ship into a monument to bot-aspirancy. I wouldn't say he spared no expense, though, seeing as how he fit it with tech I lasers. Agents D400 and Ario Drumall were alerted to this monstrosity and came to the conclusion that something had to be done. In this instance, the death penalty was certainly warranted. Here's hoping you won't see a Stratios like that ever again. Oh, and the reason why he was using tech I lasers? ...He was only 10 days old at the time. The New Order, always picking on poor newbies, right? 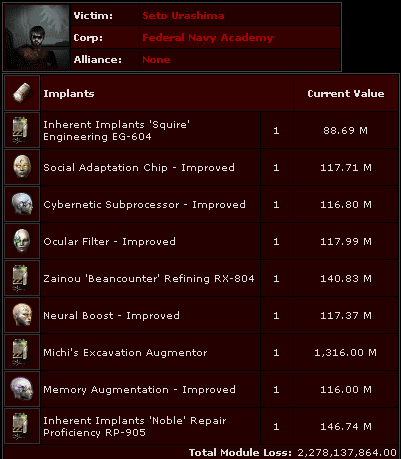 Seto Urashima lost the Pod of the Week with a 2.2 billion isk worth of implants popped by Agent Zane Arnolles. Michi's Excavation Augmentor, meet James 315's Highsec. I told you to trust me on the Rokh thing. 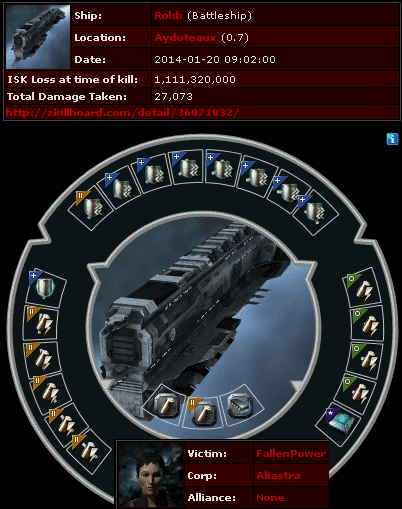 The aptly-named FallenPower lost a 1.1 billion isk shield-repping Rokh. No doubt it was intended to be used in the protection of rebel miners. But it seems FallenPower forgot about one thing. Actually, make that two things. First, she forgot about the power of the Code. That much goes without saying. Second, she forgot to find someone who could boost her shields. Agents Buck Futz, Sabriz Adoudel, loyalanon, D400, Quinn Barviainen, Vic Jefferson, Sozial Annetor, BeBopAReBop RhubarbPie, and m4d J4ck destroyed FallenPower. Oh, and the very next day, Agents reported to the system to kill FallenPower's tech II version of the same mistake. When people like FallenPower tell me that the New Order makes them want to quit playing EVE, my reaction is, "Quit playing? When did you start?" While I respect your opinion on the new(er) ships in EVE, while they do seem very out of place with the rest of the ships out there, I look to the lore for my explanation. The Stratios and likely the Astero are made by the Sisters of Eve, so they are likely to be very different from the rest of the ships made by the empires, and the Venture is made by ORE, and it has that industrial look the other ORE ships like the Orca and Hulk have. 1. No DCII, cargo rigs. Typical. 2. No amount of tank can save you against wardec, awox, killright, or improper MTU usage. 3. I don't know if using MTU to force someone into limited engagement is an exploit. For the time being I call it "evil genius" and/or "clever usage of game mechanics". 5. Mackinaw can't be effectively tanked to withstand a gank. 6. Bwahahaha. Okay, look. If you want to be a white knight, you have to fly something that a) works, and b) can protect itself if gankers come after YOU, or is disposable enough that you don't care if you lose it. This fit fails in both, because it doesn't protect much, costs too much and can't withstand anything more than a few Catalysts. But, the best advice to aspiring white knights is: "DON'T". Guarding someone is a senseless waste of your time. You can't "force" anyone into a limited engagement. It's always a choice. The choice might be indirect. For example, someone might choose to jump into lowsec and then they find themselves being engaged. They didn't get a choice "Do I want to engage in combat (Y/N)", but they had a choice about jumping into lowsec and that lead to combat. You can't say they were forced into combat. They chose to jump into lowsec, and that choice of theirs indirectly lead them into combat. Likewise a player makes a choice to deploy aggressive drones. They choose to engage and shoot at everything. This is a choice (much like the choice to jump into lowsec) that can lead to combat. No one is forced into a limited engagement. What are the mechanics behind all that, anyway? Will aggressive drones open fire on anybody with a suspect flag, or do they only aggro in these cases because their target both has a suspect flag _and_ is attacking their owner's property? Works with AFK (or not so AFK) mission runners as well. Set drones to passive, or do not a deploy a mobile structure on grid with you. I've tested this, and found it not to work in this way (at least not in high sec)... Aggressive drones have not fired on me when I'm flagged suspect. That said, this was before the MTU was released. I was just stealing from a wreck. Ahh, cool, so it's a niche case. And an awesome way to slaughter people who go AFK with drones out and an MTU on. The miner and their drones must BOTH see the action that makes you become suspect and you must be in drone range at that moment. Actually works the same way when you suicide gank a ship - you get an LE if they fire back which makes the upcoming attack on their pod legal. I thought Ophidia Black was going to submit the high value Mackinaw we killed for KOTW. I will have to ask her later. Or I might possibly just abuse her corpse because that is fun too. Yea I totally meant to send that in! :-/ On the other hand, regarding your necrophilia, I think I need to get a crew together and stage an intervention! 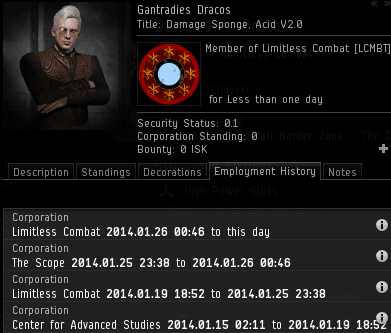 "Gantradies Dracos of Limitless Combat (snicker)"
I'm in a kills of the week post! Yay!